An air conditioning system is a big investment, and when it comes time to replace it, you want to know the job will get done right. Millie’s Heating & Air Conditioning has been providing quality air conditioning replacement services in Great Falls and the surrounding area for many years. We are always available to discuss your options with you or to schedule your replacement, so do not hesitate to give us a call today. Since air conditioning replacement is such a substantial undertaking, it can be tempting to put it off for as long as possible. But it is really best to call for professional Mclean air conditioning replacement whenever you notice that your system is not performing the way it used to. This may mean that it is not cooling your home evenly or thoroughly or that it is taking more energy to do the same cooling job it used to do. None of these things necessarily mean that you need to replace your air conditioning system. But you do need to get a professional to come out and take a look to know for sure. It is also worth thinking about replacing if your air conditioning system is more than 10 years old as just about any new system will be much more energy efficient than one that old. And if you have been calling for repairs frequently, even if they are mostly minor, replacement could be the best option as well. There are many things to take into account when you are picking out the best new air conditioning system for your home. Our professionals will help you determine which system is best for your home based on the amount of space it is meant to cool, the features it offers and how well it can be integrated with your other HVAC and related systems. It is especially important that the air conditioning system you get is the right size for the space you need it to cool. That is because a system that is too large will not keep your home comfortable, will wear out quickly from switching on and off too frequently, and will cost more to install and to run than necessary. One that is too small, on the other hand, will have many of the same problems because it has to run constantly to try and keep your home cool. While it will be cheaper to install, those savings will quickly be offset by the fact that you are paying extra in energy and repair costs. But with our professional sizing services, you can be sure that the air conditioning system you get will be just the right size for your home. Once you know what type of air conditioning system you want and how big it needs to be, our expert technicians will install it for you quickly and efficiently. We will also remove your old system and dispose of it for you, so you do not have to deal with that hassle. We are always available to take on new projects, and no air conditioning replacement projects are too big for our professionals. 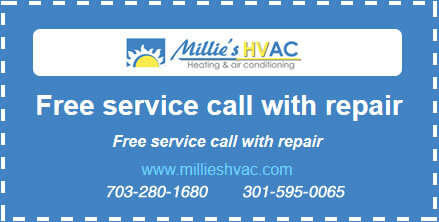 So be sure to give Millie’s a call today to get started on your way to a more comfortable, energy efficient home.